THE HYPE BROS VS THE USOSThe newly villainous Usos pounded on The Hype Bros briefly, but Zack Ryder had the brothers off balance with his speed. Jimmy and Jey, though, kept Ryder in their corner, punishing the former intercontinental champ. Mojo Rawley eventually barreled his way into the match. It didn't last long. The Usos flung Rawley around outside and attacked Ryder's knee to get the win. 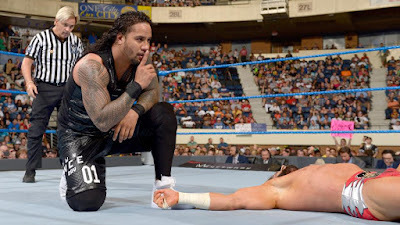 The Usos win via submission to earn a spot in the tag team tournament finals.